Can water, wine and alcohol be purchased at the final waiting areas? Yes. You can buy any type of beverage there. If I buy perfume or cologne in the final waiting areas, can they be any size? Yes. You can buy perfumes, colognes or any product in the desired quantity since there are no restrictions in terms of quantity. If I buy perfume or cologne in the final waiting areas, can I use them before I reach my destination? No. Items you buy in stores located at final waiting areas will be given to you in a sealed bag, with the receipt visibly attached to the bag. The bag’s contents cannot be opened or used until reaching your final destination. For domestic flights: only guide dogs are permitted, which much be registered with the airline they are traveling with. For international flights: pets and guide dogs are permitted. They must be registered with the airline on which they are traveling. Note: Passengers traveling with a pet must have “Cabina” or “Pet in Cabin” indicated on their ticket. Can I carry ashes or human remains? Human ashes Human ashes are permitted when the cremation document and death certificate are provided; the urn will be inspected by X-ray machines and explosive-detection equipment. Human organs: Yes. Human organs are permitted with the documentation accrediting their origin and transit duly authorized by the Secretaría de Salud. These must be placed in a sealed recipient or container with indications on the type of organ. These will be inspected with X-ray machines and explosive-detection equipment. What flights and countries do the new measures apply to? 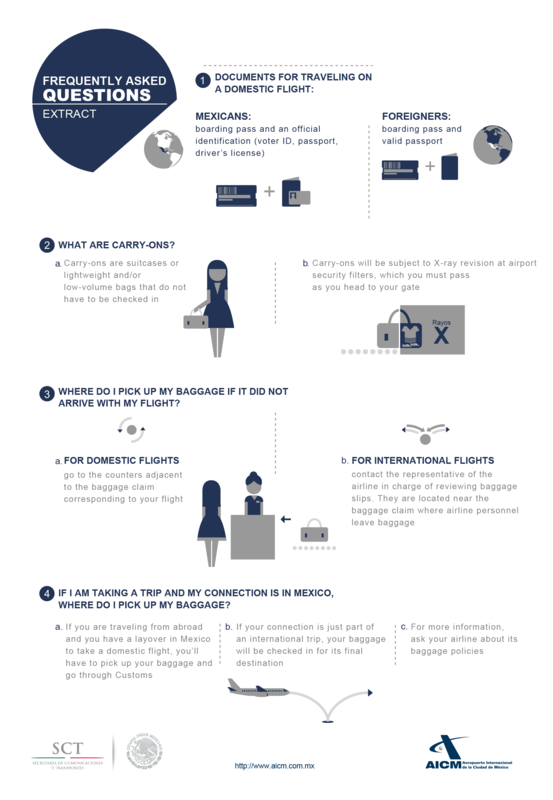 The AICM applies these measures to all domestic and international flights. We suggest you check with the airline for return trips. Yes. Liquids, gels and aerosols in any amount are permitted in checked baggage. The 100 ml restriction only applies to carry-on baggage. Can I carry liquid in my carry-on baggage? Yes. Only liquids, gels and aerosols for cosmetic use or personal hygiene that are in individual containers with a capacity of less than 100 ml (3.4 oz) are permitted. These must be in a sealable plastic bag with a maximum capacity of 1 liter (35 oz.). (per passenger). The contents must be completely placed in the bag and be fully closed. Yes. Medicine and milk and food for babies* are permitted, as well as other items for special dietary needs, as long as the amount is reasonable to the needs of the passenger and his or her itinerary. These products do not need to be placed in the resealable plastic bag. * As long as the baby is going to travel on the aircraft. Can baby food be packed in carry-on baggage? Yes. Food and milk for babies are permitted when the baby is traveling on the flight. If I am sick and need a special diet during my flight, can I pack it in my carry-on baggage? Yes. Medicine and beverages for special dietary needs are permitted. These products do not need to be placed in the sealed plastic bag, as long as the amount is reasonable for the passenger’s needs and his or her itinerary. How much liquid, gel and aerosol can I carry? Up to one liter in a resealable plastic bag with a maximum capacity of one liter (35 oz) per passenger. The contents must be completely placed in the bag and be fully closed. If I have a connecting flight, can I pack liquids in my carry-on baggage? Yes. All liquids, gels and aerosols must be in a sealable plastic bag with a maximum capacity of one liter (35 oz) per passenger. The contents must be completely placed in the bag and be fully closed. If I'm coming in on an international flight with a connection in Mexico, can I carry liquids that I bought at duty-free shops in my carry-on baggage? Products purchased at duty-free shops at the airport of origin (including alcoholic beverages) that exceed the 100 ml limit must be packed in the checked baggage at the airport where the connection is made. LAGs means liquids, aerosols and gels, including: water and other potable liquids, soup, syrup, jam, stew, sauces and paste (mole, honey, cajeta, etc. ); food in sauces or with a high liquid content; lotion, cream, perfume, cologne, cosmetics and oils; fragrances; aerosols; gels, including hair gel and shower gel; packages with pressurized contents (i.e., aerosols), including shaving cream, other foams and deodorant; paste, including toothpaste; mixes of liquid and solid substances; eye shadow; lip gloss and balm and any other item of a similar consistency at room temperature. Can I buy beverages at bars, restaurants and vending machines at the airport to drink aboard the flight? Yes, except for alcoholic beverages and when their capacity is less than 100 ml. After the security checkpoint: liquids purchased at these points of sale may be taken aboard the flight, as long as the flight is headed to the United States. If I buy a liquid or gel that is in a box, do I need to take it out? No. It is not necessary, but you should keep it in the box or sealed bag with the receipt on hand until you reach your destination. Is there a limit to the amount of liquid or gel products purchased at Duty Free shops? No. There is no limit to these purchases, but we recommend you check with your airline. Do people with pacemakers or pregnant women have to use the walk-through metal detector? Yes. The radiation given off by the walk-through metal detector is less than that of a mobile phone, so it does not affect people with pacemakers or pregnant women. However, passengers may request a manual check. Can I carry alcoholic beverages in my checked baggage? Yes. You can pack alcoholic beverages in checked baggage, as long as the amount does not exceed 5 liters. Are fingernail clippers allowed in carry-on baggage? Yes, but only fingernail clippers without a blade. What happens if liquids, gels and aerosols are not placed in the plastic bag? They will not pass security. Remember that liquids, gels and aerosols must be in a resealable plastic bag with a maximum capacity of one liter (35 oz) per passenger. Can I carry a bottle that's over 100 ml (3.4 oz) if it's not full? No. Liquids, gels and aerosols that are in a container over 100 ml (3.4 oz) are not permitted. Remember that only individual containers with a capacity of less than 100 ml (3.4 oz) are permitted. Can I travel with electronic devices? Yes. Electronic devices, such as laptops, mobile phones, cameras, MP3 players, etc., are permitted. Remember that when going through the security checkpoint, you must take electronics out of their cases and place them in a separate bin. Can people who need oxygen tanks travel with them? Can I enter if I use a wheelchair? Yes. Wheel chairs, crutches, canes and other items are permitted. Note: People using electric wheelchairs must coordinate entry with the airline on which they are traveling. Can a minor travel without a companion? Yes. Airlines provide special services for minors traveling without a companion and for senior citizens, which include accompanying the passenger to the plane or wheel chair services. Can I pack syringes in my carry-on baggage? Yes, if you are diabetic or have a disease that requires it. Medicine and needles in reasonable amounts depending on the passenger’s needs and his or her itinerary, are permitted. What measures do I follow for traveling to the United States? The TSA allows passengers to pack in their carry-on baggage personal hygiene items with a liquid or creamy consistency, gels, aerosol and mousse, stowed in the passenger cabin, provided the container (package or bottle) is no more than 100 ml (3.4 oz) and packed in a transparent bag that can be hermetically closed (Ziploc type), whose dimensions do not exceed 19 x 20 cm. (7.5 x 8 inches), for easy inspection by authorities. The TSA also permits juices, formula for babies and breast milk as long as children are traveling, as well as prescription drugs for diabetic people who can prove their medical condition, such as insulin and other medicine that does not require a prescription and which do not exceed 100 ml (3.4 oz) per container (deposit), including saline solutions for eye care. Regarding liquids, gels and aerosols purchased at airport Duty Free shops: by law, they will be delivered to passengers during aircraft boarding, immediately after having passed revision of their person and carry-on baggage. If the passenger has a connecting flight in the United States or Canada, the products bought at Duty Free shops must be packed in checked baggage so as to avoid confiscation by authorities. Products purchased on board will be delivered in transparent bags, which must remain closed until the final destination. Common and torch lighters and strike-anywhere matches. Can I pack lithium batteries in checked baggage when my flight destination is in the United States?